Student and community health took a major stride with the grand opening ceremony of ASU’s Sun Devil Fitness Complex, a $24.1 million student recreation center in the heart of Downtown Phoenix. In the past, students from ASU’s Downtown Phoenix campus used the recreation and fitness amenities at the Lincoln Family Downtown YMCA, which adjoins the new building at ground level. The building was erected in 1955 and was last renovated in 2006. 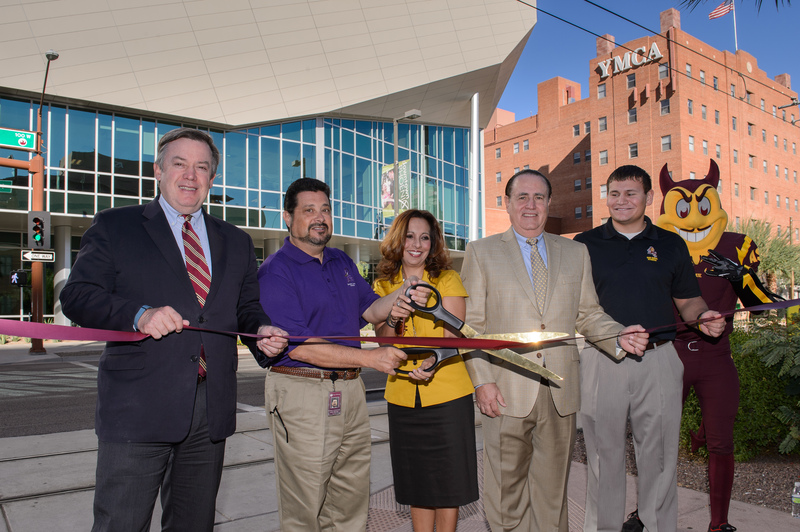 About 2,500 ASU students are members of the downtown YMCA, who partnered with the university on the new complex. Scobas said the Sun Devil Fitness Complex forges a new bond between the two long-standing institutions. “The new state-of-the-art facility not only distinguishes ASU, the YMCA and the City Of Phoenix, but cements our community with a new synergy of students, downtown residents and business people,” Scobas said. The 73,800-square-foot facility features a large gymnasium, cardio and weight space, an indoor track, multi-purpose space, student lounge, locker rooms and a rooftop leisure pool. A bicycle co-op is expected to open sometime in the fall. Exercise & Wellness, an academic program in ASU’s School of Nutrition and Health Promotion, is housed on the second floor of the center. The new recreation center is equipped with numerous energy-saving features, including a variable refrigerant flow air system and natural day-lighting balanced with solar-heat shading. Gabor Lorant Architects of Phoenix designed the building to achieve LEED Silver certification and Sundt Construction built the center. “Walk around Downtown Phoenix and you can’t help but sense the renaissance taking place. We applaud the students of ASU for their vision, the university for its development proficiency, Gabor Lorant Architects for its prowess and the many professionals that turned an idea into an impressive reality,” said Ryan Abbott, Sundt Laboratory group leader. Senior Eddie Ralph, who is a student at the Walter Cronkite School of Journalism and Mass Communication, and works at the complex as a Sun Devil Fitness aide, said the best feature of the building is its ability to bring students together. The center is funded entirely by a student government-endorsed fee of $75 per semester. No state dollars or tuition monies were used in the funding of construction. The Sun Devil Fitness Complex is one of four fitness centers across the university system that students voted to fund with an increase to their recreation fees. New Sun Devil Fitness Complexes were also constructed on the West and Polytechnic campuses, and the Sun Devil Fitness Complex on the Tempe campus was recently expanded. For more information about the new ASU Downtown Phoenix Campus Recreation, call the Dean of Students Office at 602-496-4357 or send an email to DeanofStudentsDPC@asu.edu. 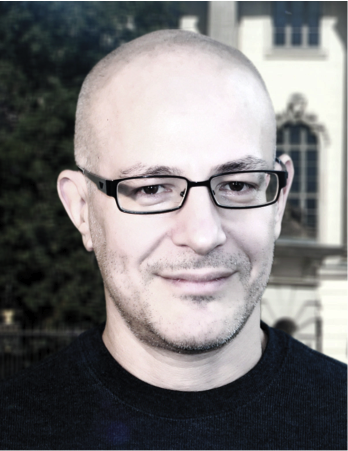 Marcelo Caruso, a professor of history education at Humbolt University in Berlin, Germany, will give a lecture titled “Borders, Frontiers and Global ‘Western’ Schooling: Conceptual Perspectives for Comparative-Historical Research” from 2:30 to 3:30 p.m., Oct. 10 at the ASU Tempe campus. Caruso’s research focuses on the international circulation and reception of educational projects and technologies in the modern world, including local developments in Germany, Spain, Argentina, Brazil and Colombia. He is a member of the editorial board of "Paedagogica Historica, International Journal for the History of Education" and is one of the directors of "German Yearbook for History of Education." He is also the author and editor of numerous published books, all in German. His lecture will explore the globalization of a model of Western schooling that has formed over the last three centuries. Caruso refers to two main forms of encounters that have shaped this process: those within cultures with written traditions, and those within orally-dominant cultures. “Through using historical-comparative perspectives, I will explore a constructed form of cultural colonialism in the long history of globalization of Western institutions,” he explains. To RSVP to the lecture, visit: carusolecture.eventbrite.com. Visitor parking is available in lots 20 and 18; parking rates apply.